Hand grip 44mm thick, close to size of parallel bar. Rubber buffer feet prevent slipping. Maximum user weight 110kg (17st 4lbs). Parallettes are useful in developing strength and balance while helping to increase confidence. 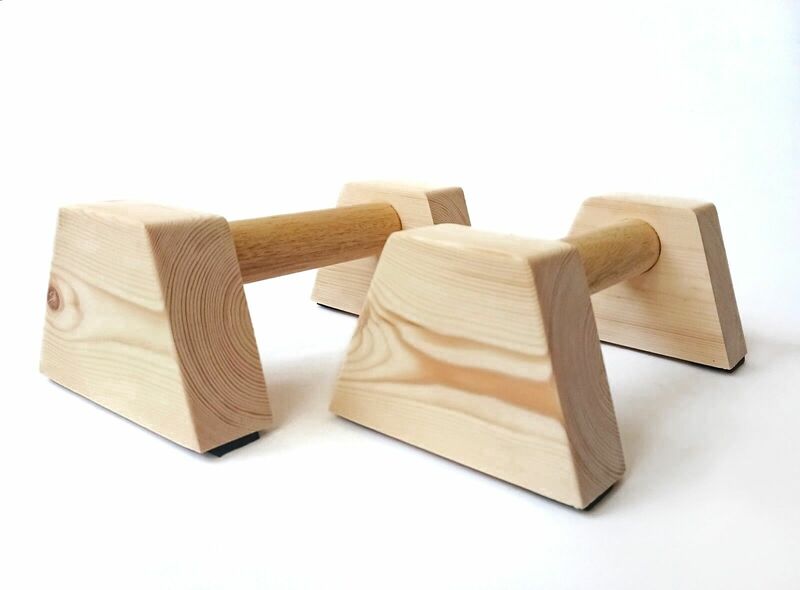 For the novice gymnast they can be used for basics such as straddle levers or as a general conditioning aid. For the more advanced gymnast a wider range of practices can be done such as press handstands and handstand turns. This new and improved design has been tried and tested by top and amateur gymnasts and calisthenics athletes in the UK and Worldwide. Solid construction made from wood that provides a far superior grip over the metal and cheap & unstable PVC plastic versions. The low sense of gravity allows you to better focus on form and execution. Perfect For Use Anywhere, And For All Levels Of Fitness. Ready For Use Anytime, Anywhere. Aid Better Grip (44mm Bar) & Give More Of A Natural Feel On Palm of Hands. But Also Aid Even Weight Distribution While In Use.